Orally consumed oils are the cornerstone of the CBD market, sublingual administration allows for the active ingredients to be absorbed quickly and efficiently through the mucus membrane in the mouth. All of our oils are of the highest possible quality, are all full spectrum; containing multiple cannabinoids which all work in harmony together and are all fully lab tested and legal. Highly concentrated CBD oil based on a 1:1 mixture of organic olive oil and our Dutch Natural Healing CBD extract with 16.5% CBD. CBDactive+ consists of the extract mixed with a revolutionary combination of ingredients. A single drop contains 1mg CBD+CBDa. The organic production and low temperature, high pressure extraction process allows these supplement products to be of the highest quality. The unique oil contains both CBD (Cannabidiol) and CBDa (Cannabidiolic Acid). Absorption rates are much higher when hemp oil is taken in liquid form. Each 3% Hemp Oil bottle contains 300 mg of CBD+CBDa (Cannabidiol), from organic certified hemp cultivars free from pesticides, herbicides and chemical fertilizers. The drops also include the most highly recommended 3:1 ratio of Omega 3s and 6s, as well as free radical-fighting Vitamin E and co-factors and co-nutrients. Ingredients: Contains only certified Hemp Oil from hemp (Cannabis Sativa), CBD+CBDa (3%), Omega-3 (1.2g), Omega-6 (4g), Vitamin E (8mg), along with naturally occurring terpenes and cofactors from hemp. 15% Raw Hemp Oil drops are highly concentrated liquid hemp oil containing 15% CBDa+CBD (1500mg). Raw hemp extracts are made using C02 from the air you breath to extract the beneficial molecules without using heat. This is similar to juicing the hemp plant, maintaining the full spectrum of cannabinoids, terpenes and flavonoids from the original plant. A cold filtration process is used to remove any waxes, improve the taste and consistency and make this oil easier to take in drops. Ingredients: Contains only certified Hemp Oil from hemp (Cannabis Sativa), CBD(15%), Omega-3 (0.75g), Omega-6 (2.5g), Vitamin E (5mg), along with naturally occurring terpenes and cofactors from hemp. CBD/CBDa (Cannabidiol/-acid): 500 mg, corresponds 37 mg / recommended daily dose. 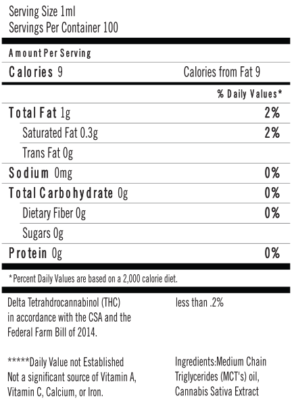 CBD/CBDa (Cannabidiol/-acid): 250 mg, corresponds 28 mg / recommended daily dose. Theseproducts are completely natural products whose ingredients, texture, flavour and colour are subject to natural variations. The stated quantities are therefore guide values. CBG (Cannabigerol) in organic hemp seed oil. 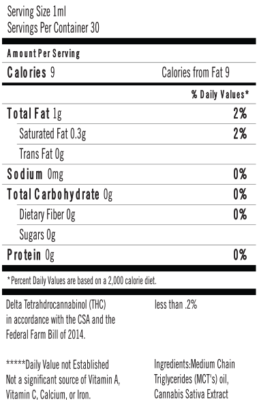 CBG (Cannabigerol): 480 mg, corresponds ~ 36 mg / recommended daily dose. One 10ml/30ml bottle of Sensi Seeds CBD Oil contains 300mg/900mg of CBD (cannabidiol).